One week ago today I saw Goldfrapp in concert at the Beacon Theater in Manhattan. I'm still not over it. Their new album Tales of Us was released the day before they took the stage in New York City, so I was still responding to its lofty majesty as the lights went down. Having loved this band more than any other for a decade now it was the first time I had the good fortune to see them live in concert. Disclaimer: for a decade I have considered Goldfrapp to be the most consistently accomplished electronic music duo in the world - and that I was seeing them for the first time as they introduced us to their most remarkable album to date was a quite lot to process. With albums as rich - and frequently sublime - as Black Cherry, Seventh Tree, Head First and now Tales of Us, they're the only logical successors to the heady years of dramatic 1980's synth pop. But in many ways I think they have surpassed their new wave predecessors. I don't say that lightly. Alison Goldfrapp's sensual vocal styling’s and the genuinely poetic structure and frames of reference heard in Goldfrapp's tracks have put them at the front rank of creative pop artists, in the Bowie, Bolan, Bush, Sylvian and Roxy Music pantheon. Goldfrapp can make music that can transport you, sweep you up on your subway commute, restore you to yourself, gladden your soul, restore your faith in life and literally bring tears to your eyes, often in the same song. Simultaneously inside and marvelously outside the times, their sound and their mission statement appears to be to completely entrance. It's rare to find an artist that can stop you in your tracks, but to find one whose voice and music can literally pull you outside of time? That's your first clue. We're not talking about a pop act here; we're talking about poets. They deserve to be as seriously considered. Read Cavafy or listen to a Goldfrapp song, it can feel like the same thing. Appearing with a 20 piece string ensemble, the Worldless Music Orchestra, in the particularly perfect venue of the Beacon, I didn't anticipate what a sonic wave of otherworldly perfection would explode from that stage. It dazzled my eyes and delighted my ears. Syth cross pollenated with strings to achieve a timeless balance of sound and feeling. Looking at the audience before the show began was instructive. I saw hordes of the most impeccably curated men and women, straight and gay, I have ever seen in one venue in this city. For a decade I have loved this band like a monk in his hermitage, when I finally had a chance to see what the rest of us looked like it did not disappoint. The crowd was also multiracial and of all ages, which was delightful to see, and they looked as enslaved by Alison Goldfrapp as I am myself. I know nothing about this singer, really. All I know is that I deeply respond to her music and she's been a constant in my life since before 9/11. That means she was a beacon through all the chaos and madness of the Bush years. I'll never stop wanting to listen to her voice for that reason. I could never adequately thank her. If Marlene Dietrich wrote and sang in a synth pop band then you'd have an idea of what Alison Goldfrapp looks like onstage. She picked the perfect outfit to play the Beacon, a retro Golden Age of Hollywood affair, that also complemented the tone and content of the new album. 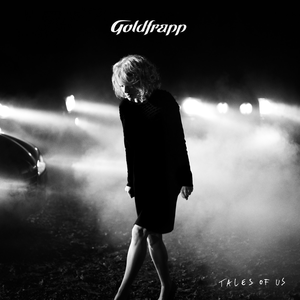 Jo, the first track on Tales of Us (all but one are named after a person) and the show's opening number is the perfect curtain raiser (the band played nine tracks from the new album). Jo brings you into the bewitching world of Goldfrapp, where vocals warm as a caress can tell the dark tail of a serial killer in a way that is utterly captivating. Not many musicians have the artistic courage to present material this difficult at the start of a new album or concert, fewer have the skill to make you want to press repeat the moment it ends. But Goldfrapp aren't just a band, fans know they're a way of being alive in the world. Critics who don't understand that really don't know how to approach them. In one sense I find it embarrassing to review Tales of Us without giving away too much about myself. Because that's the thing about Goldfrapp, they make music that's so intimate and strange that it ends up mapping a deeply personal experience for each listener. Onstage the duo was note perfect, even a little isolated from the audience in their clear attention to detail. It was a measure of the respect they have for their music and their fans that they didn't compromise a moment of the event. Live I heard new textures in the songs from the new album, such as in the showstopper Clay, a song about two soldiers in love that brought ovations, but so did track after track. Drew, the first single released from the album, is a haunting, sensual meditation on desire, life, death and the search for transcendence. I suspect the wisest choice will be to allow the lyrics and subjects of Tales of Us to emerge over time, the way I have always done with this incomparable band, because the sound is also the sense. If you haven't heard of the band, or if you haven't caught up with them lately, this is your lucky day. Entering the world of Goldfrapp takes a little patience and skill, because it asks more of you than most artists know or care how to anymore. If you do enter their world though, prepare to have your life immeasurably enriched.